So you have decided that a 24-inch snow blower is the best size for you. Your driveway is about 2 cars wide and less than 80 feet long. Average snowfall 4 to 6 inches. If you regularly get more than 6-inch snows or more than 60 inches a year. Look at snow blowers that cost more than $600. But there are about 30 different 24-inch snow blowers on the market with prices ranging from $499 to over $2500! How do you choose which one to buy? In this article, I will go through the snow blowers that sell for less than $600 and give you the features and differences between them. Every Brand has an “economy” model, Craftsman has the 88172, Ariens the Snow-Tek, MTD the Yard Machines, B&S the Murray, Husqvarna has the Poulan Pro. No frills, basic machines. I will give you my unbiased opinion on the snow blower based on repair history, service and features. No links to buy, no sales pitches, just the facts. This will help you decide which snow blower is best for you. If you want an in-depth review of a particular model look in the right-hand column and select my full review. I will tell you that if I could line up all the snow blowers in a row and go over the features one-by-one most of you would buy a machine in the $600-$900 categories. Those snow blowers have the most features that make your task as easy as possible yet affordable. All engines have electric start except as noted. Craftsman Model 88172. The Troy-Bilt at Lowes, Snow-Tek at Home Depot and Yard Machines at WalMart are also good values. Chute & Deflector: Impeller mounted, 2-way chute. Optional Warranty/Protection Plan: 3 or 5 year in-home service. Overall Quality/Value: Good. Works well for 6-inch snows. Tires are a little small for cleaning the snow off the yard for your dogs. Good quality motor! Poly skid shoes don’t mar your drive or sidewalk. My Opinion: If getting it serviced is your biggest concern this is the best snow blower for you. This is similar to last year’s Model 88957 without single-hand controls. The 88957 has been the “standard” inexpensive snow blower for a few years now. It is a good machine for the price. The Craftsman has the smallest engine, but it is powerful enough for 6 to 9-inch snowfalls. I rate it the highest in this group because has the best service network available. With this Craftsman, you can purchase the optional 5-year protection plan that includes in-home service, gas related issues (it won’t start) and wear and tear repairs. No other brand or retailer has this available. Tires: Many people complain about these “cheap, no traction tires” going flat all the time. Chute & Deflector: Top mounted Chute and remote deflector! Best of the under $600 class! Overall Quality/Value: Good. At $599 it is a good value if your local dealer wants over $700 there are better machines in the $700 range. If you shop at Home Depot, this is a very good snow blower for the money but be sure you understand the repair process if your machine needs work. 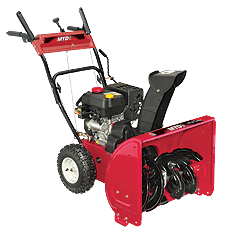 It lacks the features and durability of the Ariens brand but if you get 4-6 inch snows most of the time you’ll be happy with this machine. My Opinion: If you do not want a Craftsman this is my first choice from this list. This snow blower is made by Ariens and is very comparable in features and quality to the Craftsman and Troy-Bilt. Overall Quality/Value: Good. At $599 it is a good value, if your local dealer wants over $700 there are better machines in the $700 range. The price includes free shipping. My Opinion: If you do not want a Craftsman this is my second choice from this list. This snow blower is made by Husqvarna and is very comparable in features and quality to the Craftsman and Sno-Tek. Overall Quality/Value: Good. Steel skid shoes. Works well for 6 inch snows. Tires are a little small for cleaning the snow off the yard for your dogs. Good quality motor! My Opinion: This machine is very similar to the Craftsman 88172. Since it is under $800 it does not qualify for home repair so if you have a problem you will have to get it to the servicing dealer. If you are a Lowes customer this is a good basic machine. Because of the service issue I will always recommend the Craftsman 88172 or Ariens Sno-Tek instead of this one. Optional Warranty/Protection Plan: WalMart now has a 3 year protection plan. It claims to cover all repairs so I am assuming it does not cover wear and tear items like belts or fuel related issues. If anyone has used this plans feel free to comment at the end of this article. Service: Many WalMart customers complain about getting warranty repairs done. Overall Quality/Value: Good. Works well for 6 inch snows. Tires are a little small for cleaning the snow off the yard for your dogs. Good quality motor! My Opinion: This snow blower is very similar to the Craftsman and Troy-Bilt machines. This snow blower’s biggest downfall if the service. Many WalMart customers complain about getting warranty repairs done. You will have to haul your snow blower to a repair shop to get it serviced or repaired. Chute & Deflector: Impeller mounted 2-way remote chute. Overall Quality/Value: Poor. Thinnest metal, very little reinforcements. Small tires, LCT engine is not the same quality as the more expensive LCT motors on other brands. 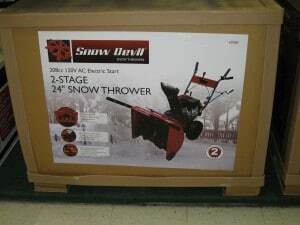 My Opinion: I am listing this snow blower because some Menard’s stores still carry it. My biggest concern is repairs. Amerisun, the importer of this snow blower does have a network of repair centers but none of them carry parts. Buyer beware on this machine. It is made as cheaply as possible. If it breaks it may be a while before you get parts or service. This machine is 100% made and assembled in China. Overall Quality/Value: Thin metal, very little reinforcements. Small tires, LCT engine is not the same quality as the more expensive LCT motors on other brands. My Opinion: This is another China snow blower but the company that is importing them is alive and well. I have talked to them and parts are readily available through their website. They are slowly building a repair network. Be CAREFUL! The price is too good to be true. By the time you pay shipping the name brands listed here are all less money. I don’t know how you go about getting repairs or warranty work done at this time. Overall Quality/Value: Good small tires, single speed or no electric starter, smallest motor of all the 24 in models. My Opinion: This model varies from retailer to retailer. Some of these do not come with electric start. This is a value snow blower made by Briggs & Stratton. It is the cheapest snow blower you can buy with a B&S motor. The retailer will tell you where to get it serviced. 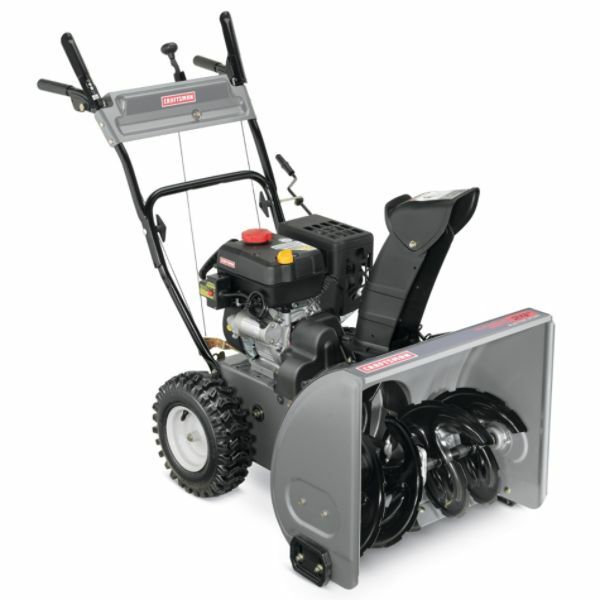 what is the horse power rating of the MTD 208cc engine used on the 24″ 6speed snow thrower? I live in Hendersonville, N.C. up in the mountais of western NC. I have a long, steep driveway and a fairly large parking area on top of the driveway. We get about 2-6 inches of snow maybe twice a year. But enough to snow you in if you do not clear the snow. Any recommendations? Hi Tommy, What are you mowing your lawn with? A tractor or zero-turn? We may be able to get a blade to fit it. Do you have an ATV? How about a front blade for it?